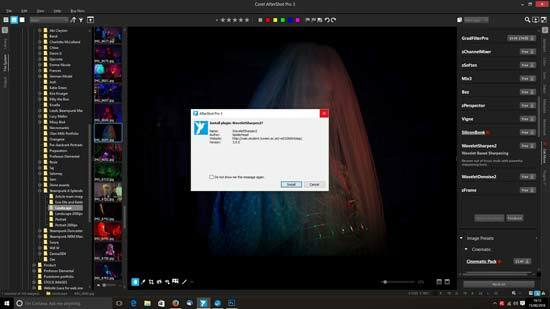 Corel AfterShot Pro 3, the industry’s fastest photo editing and organization software, offers a new highlight recovery algorithm, comprehensive watermarking, layer-based blemish correction, as well as dynamic update abilities. 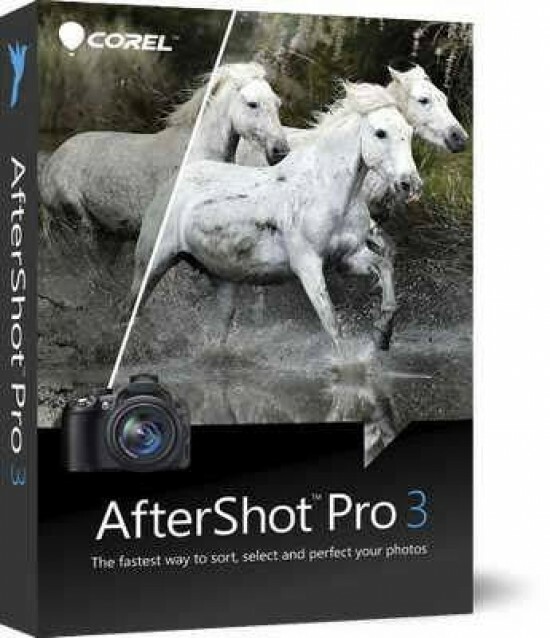 AfterShot Pro 3 is available now for Windows, Mac OS and Linux for £69.99/€89.99 and existing registered users can purchase for the upgrade price of £49.99/€69.99. Downloading and installing Corel AfterShot Pro 3 with a decent internet connection takes no longer than a few minutes (not including reading through the terms and conditions which we always do – obviously). 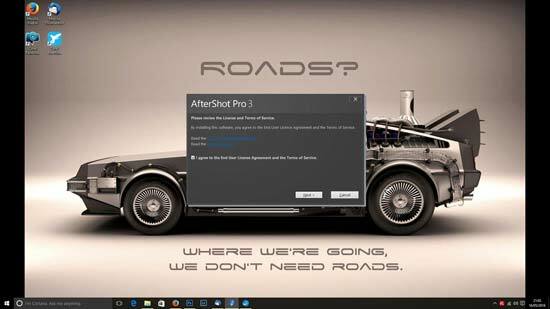 If you're considering AfterShot Pro 3 either as a new program choice, upgrade or simply as a trial to see if it's the right one for you, we did run into some problems once it was installed. We will make it clear before explaining that it isn't the fault of the program and we're only documenting this as an aid to anyone else who encounters it. The problem we had was that when we tried to launch Corel AfterShot Pro 3, the video card driver crashed and the computer froze; forcing a manual shut down and reboot. We reported this to Corel who were such an immense help in trying to solve the problem. We even received a 45 minute call from Ottowa from a technical support specialist to try and resolve the issue via remote connection. They were unsuccessful and after lots of scouring and an appeal on social media, we found that the AMD Radeon graphics cards we use have an Evolve App which was causing the crash. We uninstalled the drivers, reinstalled from the Radeon website, unticking the App so that it wasn't installed and everything worked perfectly. If you have similar problems, take a look at your graphics card and if you're still unsure, give the manufacturer of your computer or graphics card a call to assist you. 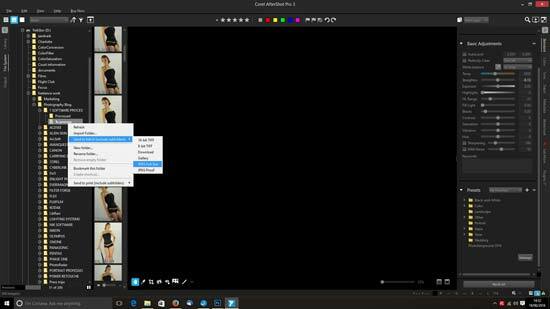 The layout of Corel AfterShot Pro 3 is essentially the same as Pro2, so upgraders won't have to fight with a new UI. The main window is still split into three sections. The left is the navigation tool. You can choose where you would like to import your pictures from by selecting one of two tabs down the left side – the third is reserved for outputting images via batch process or printing. Creating a Library will enable faster location of pictures in the future and it's similar to tagging pictures in that it's extremely useful in the future, but boring as Hell while doing it. If, like us, you have a neat, methodical filing system on your computer anyway, you can arguably get away with just using the File System tab. This lists every file path on your computer so you can locate images that you wish to use with ease. Selecting a folder with pictures in will list them as thumbnails in between the left section and the preview pane in the middle. This can be altered by choosing a different layout option by clicking on one of the three icons in the top left of the window, just below File. As always, what we really want to know is what's new on the program and how good it is. New features on Corel AfterShot Pro 3 include a new watermarking feature, Image Preset Library, Lens Correction Development Kit, Lens Corrections, new raw camera profiles, Modular Camera Profiles and a new option to send new ideas you develop back to Corel. 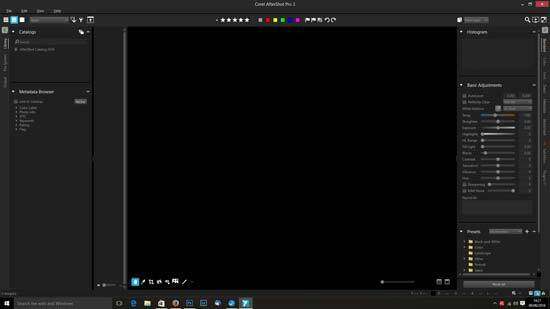 Looking at these new features in turn, the Watermark feature is found in the Tools on the right side of the window. There's two options for loading an image in or simply writing some text. In order to obviate the need for repetition, you can save any watermarks you create for future use. You can also adjust them, skew and stretch them as you desire. Should you have a transparent background that you wish to utilise, then you need to use either a PNG or SVG file. A PNG can be saved in the Save For Web options. To use a JPEG, any clear backgrounds will show up white. 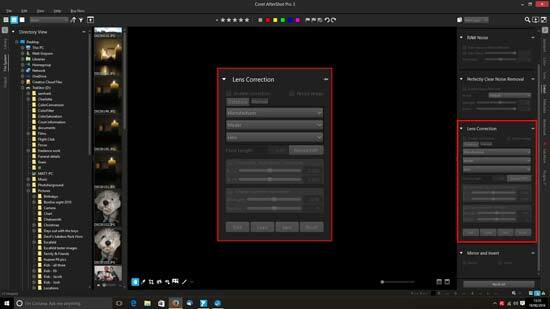 The Image Preset Library access point is situated next to the Watermark tab in the Tools section down the right side of the program. There are a mixture of free and paid for presets. Free ones tend to be Camera Profiles and there's also a few Plugins such as Grid (a composition aid), Channel Mixer (enhances black & white images), Perspector (Perspective Correction) and Wavelet Sharpen (recovers out of focus images) among others. There's also a couple of graduated filters which are chargeable. Outside of the Plugins, you can also choose from a selection of image presets under various themes such as cinematic, tonal, landscape, portrait, black & white, wedding, sepia and colour. These are all chargeable, so get them only as you actually need them. Each of these presets has five templates to work on for the single price. 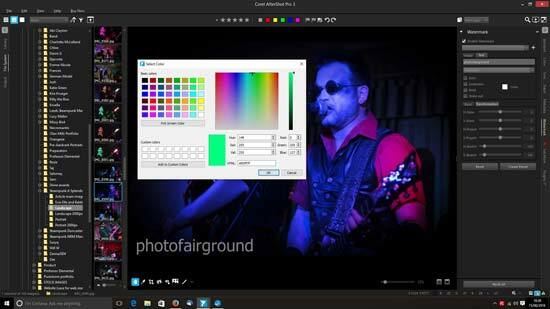 Corel have invested heavily in lens correction development for this latest version of AfterShot Pro. A built-in preset correction system can compensate for barrel distortion and pincushion. However if you want more control, or if it needs more finesse, then you can use the Lens Correction Kit whereby instead of choosing the camera and lens combination and relying on the EXIF data, you can flip over to manual mode and adjust the radial correction coefficient values. This section arguably uses Brown's (Brown-Conrady) Distortion model which corrects for radial distortion when elements in the lens aren't perfectly aligned. The software corrects the distorted pixel after determining which is distorted and which isn't and applying a reverse distortion. Another new feature is a feedback button at the bottom of the “Get More” tab in the Tools section. It's located at the base of the Plugins list which is also where the modular camera profiles can be downloaded from. To (send feedback) click on the button and fill in the form. This is a way to get involved in the development of AfterShot for future versions and on the surface it looks like they're attempting to build a community of developers through their customers – a bit like Soundforge currently do – which sounds interesting, but Corel don't seem to be giving away versions of the program for free as payment.